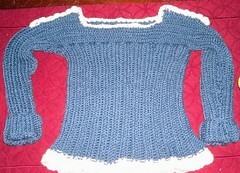 This is the sweater that I knit for Olivia, Mary's grand niece - Melanie's daughter. I wanted something different and this was just that. The arms and top of the sweater are knit long ways and then you pick up stitches along the bottom of it and knit the body. I am a slow knitter but this didn't take me too long to do it. It is knit in Cascade 220 superwash in a demin color with Cascade 220 superwash in an off white as accent. The shoulders each have 3 little white rose buttons to keep it closed. The accent is not part of the pattern, I put a crocheted shell edging on the bottom to dress it up a little and make sure that no one would think she was a little boy. Hope it fits and she likes it. I am not even sure that she has seen it yet but if I don't blog now, I won't remember. And if you haven't checked out patternfish, this is a good opportunity to do just that. You won't find any free patterns but you will find some cool ones. Enjoy. Don't look now but there is knitting going on. 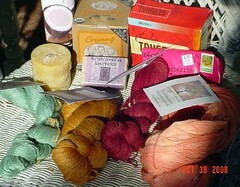 Actually I have been doing quite a bit of knitting. I just keep forgetting to take pictures of it. This is a project that I finished this summer - stole back from Mel and Olivia and just realized I hadn't posted it. Very cute hat, made for a two year old - so doesn't fit just yet but fun to do, fun to pratice a little bit of color work and extremely easy. Could be for a girl or boy, just remove the flower on top. 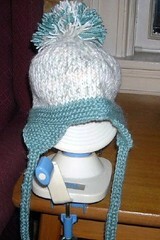 I like to knit rolled brimmed hats. And babies look good in rolled brimmed hats. You can use up small amounts of yarn and still get a nice looking project. Olivia, I imagine, will be receiving many rolled brimmed hats. That is what I was doing at 5:30 on Saturday night after spending time at Aleksa Cars in Salem, NH. Mary and I went and met with Ralph and Dan and after about 30 minutes, a test drive and some signing of papers, barring any unforeseen issues this lovely lady is all mine. Please met Miss Moon - my new (to me) Hyundai Santa Fe SUV in Moonlit Blue. Isn't she loverly????????? Lots of room for roving kids, my wheel, groceries, and camping things. Thanks for all the good thoughts as we went through this process. It was not painless but it was not too painful either. Yes it is....it is knitting. A finished knitting project. I can't believe it. Actually it has been finished for a while but I couldn't post it because the reciepient reads the blog and I didn't want her to see it. Now it is done, and gifted so here it is. 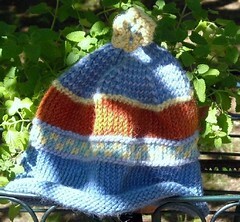 This pattern was easy to do, easy to memorize and even easy to change yarns and sizes, etc. This is Lace Panel Pullover from Nashua Handknits Spring and Summer 2008 booklet Blossom. It was done in JoJo Land Melody - Superwash. LOVE IT. This is for our new grand niece Olivia. Hope she likes wearing it. Last spring at the NHSW I purchased some wonderful orange Finn/Corridale roving and then at the Revival this summer, managed to get some multi-red merino roving. I decided to blend them together. Having never done this, I of course looked to Julie to figure out how to do this. She had purchased a hackle last spring and was glad to give me a lesson on it. You place some roving on to the deadly looking nails, then put a second layer on and so forth until you have the blend that you are looking for. 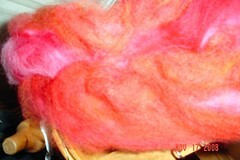 You then pull it through a diz (piece of wood with small hole in it) and you create blended roving. Lots of fun. This is how it looks spun up.